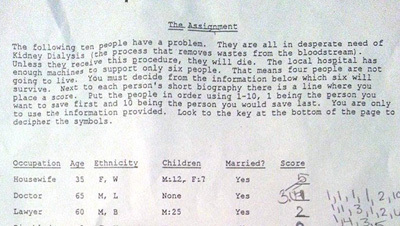 A central Illinois school recently gave students an assignment many are calling a “death panel” assignment. The fifteen year olds were told to decide what six of ten people would be allowed to get life-saving medical treatment. The school, St. Joseph Ogden High School in St. Joseph, IL, presented students with the situation where ten patients needed dialysis treatments. But, the kids were told, the local hospital only had six dialysis machines with which to save their lives. Four people must die, the assignment gravely said. 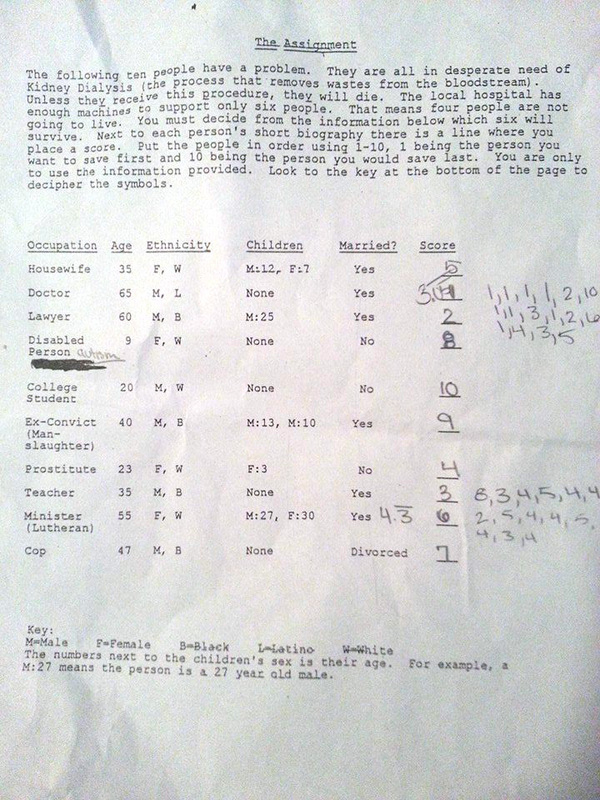 Then the kids were given a list of descriptions of ten people and were told to pick the six who would get the treatment and the four who would die. On the list were a lawyer, a housewife, a doctor, a disabled person, a college student, an ex-convict guilty of man-slaughter, a prostitute, a teacher, a cop, and a Lutheran Minister. Kids had to choose which of these people would live and which would die. The class was a social sciences class and the assignment is the sort of ethical dilemma scenario that college students are often presented in philosophy classes. But many are questioning the propriety of giving 14 and 15 year olds such an assignment. The school did respond to questions in a statement by school principal, Brian Brooks. But some Illinoisans are wondering if this is an appropriate assignment. Questions on whether or not this is a part of Common Core curriculum, exactly who approved of the assignment, and why was the assignment really created are being asked by parents and others in the Land of Lincoln.